Two persons were Monday arraigned for allegedly attempting to traffick more than nine kilogrammes of cocaine in frozen fish to the United States (US). Chief Magistrate, Ann Mc Lennan refused bail to 27-year old Safoor Ali of 11 La Jalousie and 22-year old Lazeean Imrazie of Goed Fortuin, West Bank Demerara. They were remanded to prison until July 7, 2016. They pleaded not guilty to the charge that states that on June 8, 2016 at Cheddi Jagan International Airport, (CJIA), Timehri they trafficked 9.44 kilogrammes of cocaine. 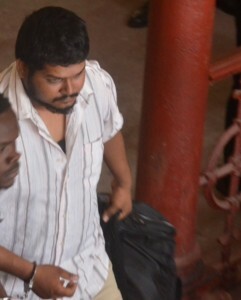 Police Prosecutor Deniro Jones told the court that Ali and Imrazie declared 33 boxes of fish bound for the US. Jones said Imrazie gave police another address as 23 La Jalousie, West Bank Demerara. Ali and another unknown person own an aquaculture farm.